Walkerville Publishing Inc. is a publishing house created and run by the husband and wife team of Chris Edwards and Elaine Weeks. Chris Edwards was born and raised in Central Windsor. Elaine Weeks was born in Walkerville. They published the Walkerville Times newspaper and created the Windsor-based publishing house Walkerville Publishing. Weeks graduated with a B.A. in English from York University, while Edwards received a M.A. in Communication Studies from the University of Windsor. The couple moved to North Okanagan, B.C. in 1990 and then to Richmond Hill, Ontario in 1996. They relocated to Walkerville in July of 1998. The couple began their publishing career in 1999 with the Walkerville Times, a magazine that focused on local history of the Walkerville area. In February of 2000, Walkerville Times set up its office at 624 Chilver Rd. The periodical continued publication until 2007.Weeks and Edwards have authored and published numerous books about Windsor through Walkerville Publishing: Best of the Times Magazine (2006); Postcards from the Past, Volume 1: Windsor and the Border Cities (2007); Windsor Then: A Pictorial Essay of Windsor Ontario’s Glorious Past (2011); 500 Ways You Know You’re From Windsor (2012); A Forgotten City (2013); Walkerville: Whisky Town Extraordinaire (2015); and 5000 Ways Your Know You’re From Detroit (2017). Mazur, Alexander. 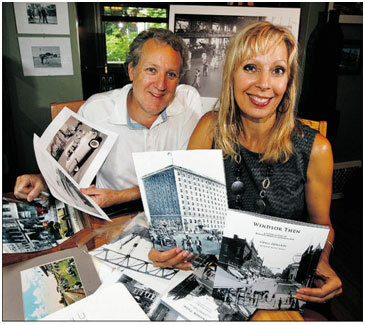 “Local authors to bring Walkerville’s history back to life Wednesday night.” Windsor Star. 14 Dec, 2015. Web. Accessed Feb. 12, 2018. Pearson, Craig. “New Windsor-made book explores 5,000 things about Detroit.” Windsor Star. Nov. 1, 2017. Web. Accessed Feb. 12, 2018. Walkerville Times. Web. Accessed Feb. 12, 2018.